I. M. Imprimit is the private Press of artist Ian Mortimer. It was set up in 1969 with a single Albion hand press specifically to print the wood-cuts and wood-engravings of its founder. Type soon followed to extend the printmaking workshop to include typography and letterpress printing. At a time when trade letterpress printing was fast giving way to offset litho and, later, to the computer, it was possible to build up a large range of foundry types, including many rare and unique typefaces, and the Press has what is probably the largest collection of wood poster types in the country. The nineteenth-century iron hand-press with its unequalled versatility has remained the staple tool of production, enabling the Press to carry out work which neither power-driven machine nor computer could undertake (see The Hand Press, Artists’ Prints, Fine Editions). With the present range of six Albion presses and a large Columbian in use, I. M. Imprimit is arguably unique as a craft letterpress workshop. In 1995 Ian Mortimer was awarded the coveted prize, the Premio Felice Feliciano, for the design and production of the Press’ publication Ornamented Types. 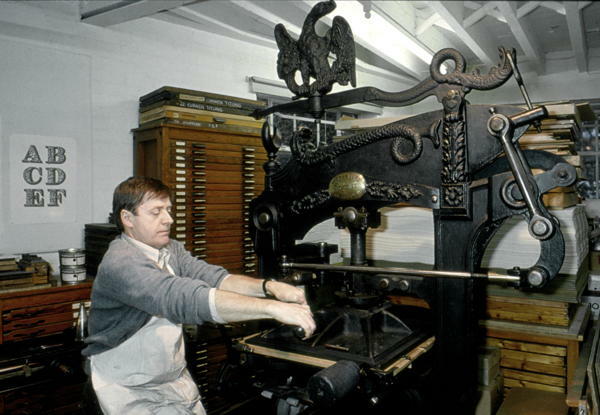 In 1996 Mortimer was appointed OBE for Services to Fine Printing. The press-mark, a wood-engraving by Ian Mortimer, follows a time-honoured tradition of early printers’ marks using a rebus based on the printer’s name. 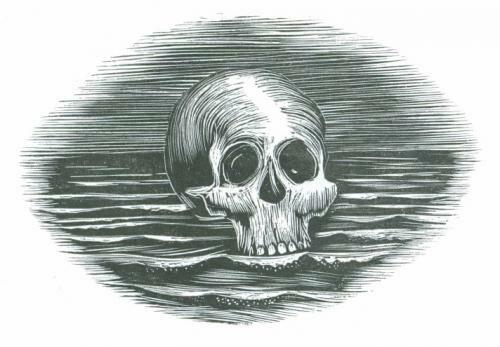 In his case the image is inevitable: mort (death) and mer (sea). Because of its sombre nature, however, it has rarely been used in the Press’ productions. This website is in two main areas. Printing and Typography is divided into six sections showing the variety of I. M. Imprimit’s activities: artists’ prints, fine editions, posters, cards and other ephemera. Ian Mortimer, artist shows Ian Mortimer’s own work, rarely exhibited: it includes drawings and paintings, and some of the black-and-white side-grain woodcuts that led directly to the founding of his Press.